In the near future, an unknown virus starts to attack the human race. First symptoms include an overwhelming sense of grief - then a complete loss of smell. Panic ensues as no one knows what causes the virus, where it came from or if it is contagious. It is. Very contagious in fact - and there is no cure. Things go from bad to worse when other senses come under threat. Click Here To Get Reviews Delivered Straight To Your Inbox! The idea behind Perfect Sense is an interesting one. What would we do if we started to lose our senses? Which senses can we live without? Which senses would, if they were lost, make life unbearable? I enjoyed the first half of this film. 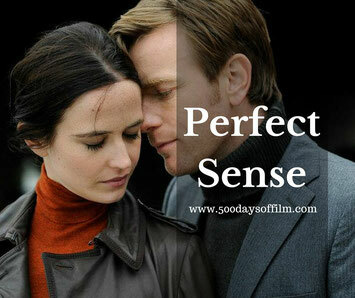 I liked the premise and I was happy to watch the development of the relationship between scientist, Susan (Eva Green) and chef Michael (Ewan McGregor). Both actors give strong, sometimes powerful performances. Meanwhile, director, David MacKenzie, tells his story well and builds the film’s tension and sense of dread competently. However, Perfect Sense soon becomes unremittingly bleak. I really couldn’t say that I enjoyed it - I actually felt pretty depressed afterwards. Perhaps Susan and Michael’s love was supposed to be the counterweight to the rampaging virus and sensory loss. Perhaps they were supposed to be the film’s antidote. I just didn’t feel it and, as a result, couldn’t recommend Perfect Sense. Sorry. Have you seen Perfect Sense? Do you agree with my review? Whatever your opinion, I’d love to know - do leave me a comment in the box below!